We are on a mission to bring affordable guitars to everyday people and cut out the middle-man. That's why we choose to only offer our guitars online. 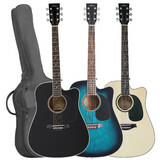 We are committed to giving you the lowest prices and offering an alternative to paying over-the-top prices for guitars. Artist Guitars started because I wanted to sell the best value guitars I could to you. I found it frustrating that improvements I wanted to make to my designs just weren't possible due to the price pressures of working for a wholesaler. When you buy products from a traditional retail outlet they have often been marked-up up to 4 times. The retailer buys from a wholesaler, the wholesaler buys from a brand, and then the brand buys from a factory. We buy direct from the factory, and sell it straight to you over the internet, so you can get the best possible price and value. You can't buy an Artist Guitar in any other store because we choose not to sell to other retailers. We have a totally different business model and have chosen to market and sell our products online. This means our costs are down, and we can pass those savings on, directly to you. All our musical equipment is designed for players of all levels, from beginners to seasoned musicians. We make sure that our products are built to a high quality. Since we started in 2009, we have shipped over 60, 000 orders to Australians just like you. Everything from guitars, strings, leads and accessories etc. Our promise is simple - Good quality products at Direct Prices.